For the pickiest of eaters, we also included a garden station which had an array of breads, cheeses, fresh fruit and vegetables. 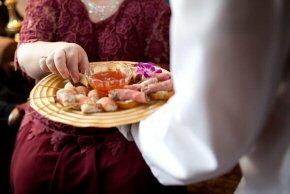 We offer our guests a plated sit down dinner accompanied with Assorted Warmed Ciabatta Rolls including Parmesan, Roasted Red Pepper, and Tomato Basil Along with Mini Muffins served in baskets. Shrimp Poached in Court Bouillon, Saut�ed Scallops and Jumbo Lump Crab Served with Saffron Rice & Pimentos. Saut� Fresh Vegetables of Baby Corn, Carrots, Green Beans Red Peppers, Snap Peas and Water Chestnuts. We had a white three-tiered pound cake with butter cream frosting. 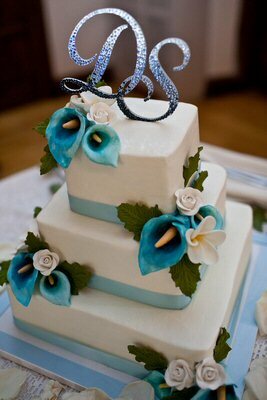 The cake was lined with a light blue satin ribon and decorated with gum paste Calla Lilies, Plumeria and Roses.